Malaysia’s top leading amateur Gavin Kyle Green today confirmed that he will be coming home for the upcoming Maybank Malaysian Open in February 2015. 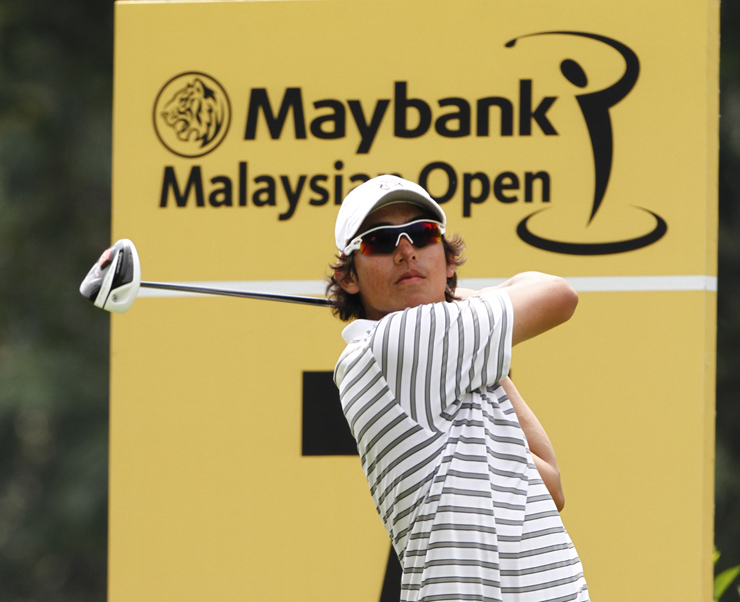 Kuala Lumpur, 22 October 2014: Malaysia’s top leading amateur Gavin Kyle Green today confirmed that he will be coming home for the upcoming Maybank Malaysian Open in February 2015. It will be Green’s fourth attempt at the coveted trophy and could possibly be his last time playing to an amateur status on the co-sanctioned European Tour and Asian Tour event. “We’ll see how it goes,” when asked what will be his next step in his golfing career after graduating next year. Last month, Green became the first collegiate golfer to pick up three consecutive William H Tucker titles, making this his 6th individual title with University of New Mexico (UNM), USA- the most ever recorded. Green credits his exposure to the game at a professional level through the European and Asian Tour’s co-sanctioned Maybank Malaysian Open in years past for his achievements to date. In 2013, Green topped Malaysian professionals to finish joint 22nd, his best finishing in three participations and the best by a Malaysian. To further enhance his skills for the 54th edition of the Maybank Malaysian Open, Green will be competing at three more tournaments before heading home. “The Maybank Malaysian Open has given me plenty of opportunities to play alongside international stars and I have learned a lot from all the golfing greats. Participating in a world-class event like the Maybank Malaysian Open over the past few years has helped me better prepare myself for tournaments in my collegiate career. The experience, training and mental conditioning will be priceless in years to come as I aim to help the team get into the National Collegiate Athletic Association (NCAA) Men’s National Golf Championships and hopefully win the championship this year. That would be awesome,” said Green. Green previously broke two records while in his senior year at UNM. Aside from the top individual honours, he helped the Lobos become the first team to win three straight titles since Houston back in 1968-70. The “Lobo” was adopted as the school’s nickname in 1920 and it was not long thereafter that a real Lobo, a wolf, became the mascot. Students of UNM have since been named as the Lobos, carrying the fighting spirit of the wolf in them as they compete for the glory of the university. Green, 21, has confirmed his participation at the prestigious Maybank Malaysian Open 2015 in hopes of creating history while paying tribute to the undying devotion of his parents in supporting his golfing ambitions. Currently ranked 16th on the World Amateur Golf Ranking (WAGR – 22-28 September), Green made headlines this year through a record-breaking win on the Asian Development Tour (ADT) at the PGM Vascory Templer Park Championship in June. He has also made two of three cuts at the European and Asian Tour co-sanctioned Iskandar Johor Open. Green will be one of the 22 Malaysians attempting to become the first ever Malaysian to take home the coveted Maybank Malaysian Open trophy in 2015. He will compete against notable golfers at the 2015 Maybank Malaysian Open, set to take flight on 5-8 February 2015 at the majestic Kuala Lumpur Golf and Country Club.